It is melancholy to know that in our country we connect every roots with the roots of religion. We often term RSS as communal organization. Even the Wikipedia quote "Rashtriya Swayamsevak Sangh (RSS) is a right wing charitable, educational, volunteer, Hindu nationalist, non-governmental organization". But in fact after having a closer look at R.S.S I can say its infact the organization misunderstood. Expressed in the simplest terms, the ideal of the Sangh is to carry the nation to the pinnacle of glory, through organising the entire society. The Sangh's method of working is of the simplest kind, and there is hardly anything perplexing about it. Sangh’s USP has always been growth by personal contact. Its success lies on the fact that Sangh is a people’s organization but the organization has been often misunderstood. I see nothing wrong with being a conservative and RSS has done great things for this nation. RSS ideology is based on a principle of selfless service to nation and its volunteers from time to time have proved their commitment towards it. The most visible symbol of the Rashtriya Swayamsevak Sangh is its daily shakhas. The Shakha is as simple in its structure as it is grand in conception. Its volunteers are also known for their efforts in relief and rehabilitation work during natural calamities and for helping with more than 100,000 charities and educational/service programmes in the fields of education, health care, rural development, tribal emancipation, village self-sufficiency, rural farming and the rehabilitation of lepers and special needs children. a. Literally within minutes RSS volunteers were at the scenes of distress. Across Gujarat, the (RSS) cadres were the saviors. Even as the state machinery went comatose in the first two days after the quake, the cadre-based machinery of the Sangh fanned out throughout the state. 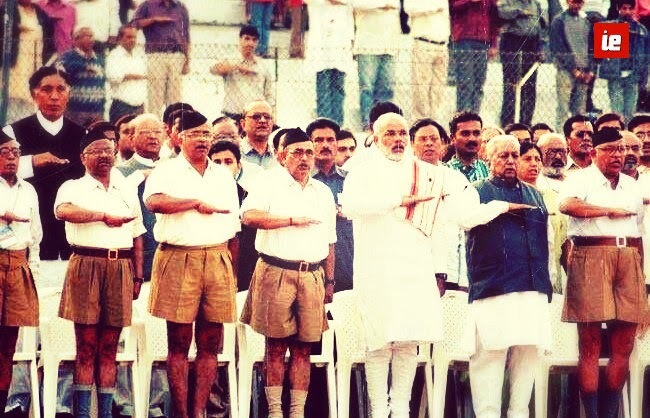 Approximately 35,000 RSS members in uniform were pressed into service. b.This is an old tradition in the RSS. To be the first at any disaster strike: floods, cyclone, drought and now quake. In Kutch, too, the RSS was the first to reach the affected areas. At Anjar, a town in ruins, the RSS was present much before the Army took the lead in finding survivors and fishing out the dead. c.The RSS volunteers carried out relief and rehabilitation work after the floods ravaged North Karnataka and some districts of the state of Andhra Pradesh. d. According to Cho Ramaswamy, the editor of Tughlaq magazine, the RSS-sponsored Seva Bharati did provide service following the 2004 Indian Ocean tsunami, despite a lack of formal acknowledgment. In 1971 when Indira Gandhi was asked to step down due to here electoral malpractice, she declared National Emergency, thus bringing the democracy to grinding halt. The RSS defied the ban and thousands participated in Satyagraha against the ban and against the violation of human rights regulations. Later, when there was no letup, the volunteers of the RSS formed underground movements for the restoration of democracy. Literature that was censored in the media was clandestinely published and distributed on a large scale and funds were collected for the movement. Networks were established between leaders of different political parties in the jail and outside for the coordination of the movement. It said that the movement was "dominated by tens of thousands of RSS cadres, though more and more young recruits are coming". Talking about its objectives it said "its platform at the moment has only one plank: to bring democracy back to India". The RSS has advocated the training of Dalits and other backward classes as temple high priests (a position traditionally reserved for Caste Brahmins and denied to lower castes). They argue that the social divisiveness of the Caste system is responsible for the lack of adherence to Hindu values and traditions and reaching out to the lower castes in this manner will be a remedy to the problem. The RSS has also condemned 'upper' caste Hindus for preventing Dalits from worshipping at temples, saying that "even God will desert the temple in which Dalits cannot enter"
President Zakir Hussain, the former President of India once told to Milad Mehfil in Monghyar on 20 November 1949 "The allegations against RSS of violence and hatred against Muslims are wholly false. Muslims should learn the lesson of mutual love, cooperation and organization from RSS." Hindutva plainly describes the way of living of people living in Hindustan or India and also Hinduism is the only religions that says "Sabka Mallik Ek" which means god is one only in different forms. In RSS girls are treated as mother, sister. There is a RSS wing rashtriya mahila samiti who involves in all national activities like RSS. I cannot explain it here but once you go RSS meeting or any other event you will get it more accurately. RSS is indulge in giving moral values to society. If you visit RSS shakha, you will experience it. The ex prime minister of India Mr. Atal Bihari Vajpayee is RSS swaymsevak and present PM Mr. Narendra Modi is also. Even you can read Mr APJ Abdul Kalam's statement on RSS. I think this is enough to begin with if you want to understand RSS. It’s a need of hour to understand RSS, infact, it’s a organization misunderstood! !